Detention conditions for women need to be humanized – Russia’s Ombudsman Moskalkova | Russian Legal Information Agency (RAPSI). MOSCOW, March 6 (RAPSI) – Russia’s High Commissioner for Human Rights Tatyana Moskalkova has stressed the need to mitigate the severity of punishments for women and suggested that a range of measures aimed to humanize their detention conditions are to be developed, according to the Ombudsman’s press-service. Russia’s Rights Commissioner focused on this problem when addressing a session of the Global Alliance of National Human Rights Institutions (GANHRI) underway in Geneva. Moskalkova believes that in the context of protection of women’s rights there is a problem related to the lack of special standards applicable to convicts. According to the statistics for year 2018, the Ombudsman’s office received 322 (8.2% of the total number of complaints) applications from women in custody regarding the respect of their rights, which mostly concerned detention conditions, health care, employment assistance, petitions for release, deferral of punishments, or amnesty. The Ombudsman has shared the Russian practice of protection of women’s rights with the audience. Thus, according to Moskalkova, the Rights Commissioner’s office took part in the development of a law protecting the rights of children whose parents were in detention, which set a range of preferences for female convicts. Among other measures, the Ombudsman said, in 2017 the Russian Government approved the National Action Strategy in Women’s Interests for years 2017 through 2022; in 2018 there was approved an action plan aimed at the implementation of the Strategy’s first phase. Every three years, Moskalkova added, the Eurasian Women Forum is convened in Russia under the aegis of the Chairperson of the upper house of Russia’s Parliament. In 2018, this forum brought together over a thousand of women leaders from 110 countries and representatives of leading international organizations. The same year Russia for the first time hosted the W20 event, the Rights Commissioner said. 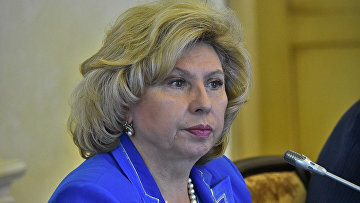 12:42 06/03/2019 Russia’s High Commissioner for Human Rights Tatyana Moskalkova has stressed the need to mitigate the severity of punishments for women and suggested that a range of measures aimed to humanize their detention conditions are to be developed.